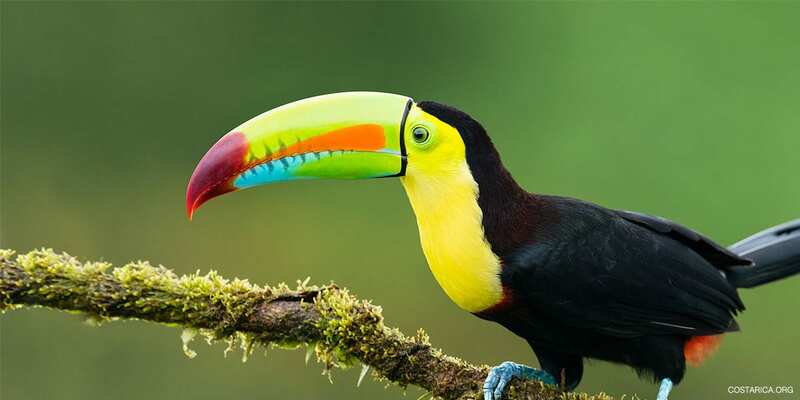 Costa Rica Ecotourism is world-famous for its progressive efforts and extensive national park system. The strong emphasis on sustainable practices and development of protected areas has boosted ecotourism in Costa Rica to a large degree. This is a mission close to My Costa Rica’s own philosophy and our Costa Rica Ecotourism nature packages are perfect for the environmentally aware Ecotourist. Those looking to experience an incredible degree of biodiversity will be in their element in Costa Rica. Due to its geographical location, Costa Rica acts as a bridge between the northern and southern hemisphere which in part accounts for the incredible diversity of flora and fauna found here. In fact, here are some numbers. Costa Rica only accounts for 0.03 % of the earth’s surface but holds within it 6 % of the world’s biodiversity. The country is flanked by a Pacific (1103 kilometers) as well as Caribbean coastline (255 kilometers) and consists of 12 life zones. Take a Walk on the Wild Side – Spot Costa Rica Animals in the wild! Nature will inevitably be featured in every area you travel to while visiting Costa Rica. But some particular areas are more suitable for nature lovers who want to to discover the variety of bioversity. Let us help make this the trip of a lifetime! The top destination for the most diverse species of Costa Rica animals is without a doubt Corcovado National Park. This remote corner in the Southern Pacific coastline of Costa Rica is known as the most biologically diverse area on the planet. This park alone holds 16 ecosystems and a large variety of mammal species as well as many others! Many naturalists from all four corners of the world come to Costa Rica just to be in Corcovado in the hope to catch a glimpse of all four monkey species up in the trees, all four sea turtle species by the coast and over 40 frog species. In addition, there are 100 butterfly species, 10,000 insect species, several types of snakes and over 25 lizard species. You can find all six feline species, tapirs, crocodiles, peccaries and over 400 bird species including the stunning and endangered Scarlet Macaws! Just off the coast of Corcovado lies Caño Island Biological Reserve, although not part of Corcovado National Park, it’s available for park visitors as a prime destination for snorkeling and scuba diving. Manuel Antonio, Costa Rica’s smallest National Park. Despite this, the modestly sized area boasts an impressive ecosystem filled to the brim with wildlife and naturalists seeking encounters with sloths, monkeys, toucans, snakes, iguanas, the basilisk, crab-eating raccoons and other incredible jungle creatures. Taking advantage of the services of a licensed park guide to point out all the hidden wonders of Manuel Antonio National Park is highly recommended. They will guide you through easily accessible paths in the park and show you one of Central America’s most beautiful beaches. Animals visit hotels in Manuel Antonio all the time. Sometimes, all you have to do is look out your window to see a bunch of monkeys passing by. Tortuguero protects the immense tropical rainforests and river network and canals parallel to the ocean that once, many years ago, served the logging industry in this remote area of Costa Rica. Tortuguero’s population of animals includes four species of marine turtles that nest on its black sandy beaches and vibrant shore creatures like crocodiles, caymans, river turtles, monkeys, snakes and lots of other river animals. Travel to the Caribbean for a rich and authentic cultural experience. The Afro-Caribbean atmosphere in this part of Costa Rica is alluring, but so is the abundance of its nature. Costa Rican Southern Caribbean beaches like Playa Cocles, Punta Uva, and Manzanillo have large areas of tropical rainforest where sloths, toucans, monkeys and other tropical flora and fauna can easily be spotted overhead along the main road connecting these wonderful beaches. Cahuita National Park is also found in this region. The park’s nature trails along the beach are teaming up with all sorts of wildlife on land and under the water. Cahuita is a favorite destination for snorkeling in Costa Rica. The trails in Cabo Blanco are a real treat for nature hikers. They take tourists through humid forests, which in just a few steps turn into dry forests. This means you will get the unique opportunity to spot animals that inhabit both these areas. A beautiful beach is at the end of the trail which in total can take five hours to walk. This area is known as the first nature reserve in the country and a testament to the further conservation efforts Costa Rica is laureated for. Cabo Blanco is between the beaches of Montezuma and Mal Pais at the tip of the Nicoya Peninsula. Costa Rica is famous for some of its volcanoes, many of them active. The Central Valley boasts giants like Irazu volcano, Barva, Poas and Turrilaba surrounding San Jose Costa Rica. The rick soil surrounding these volcanoes make for the perfect, fertile grounds to produce the country’s world-renowned coffee. When in San Jose, you can also learn about Costa Rica’s orchids by paying a visit to the Lankaster Botanical Garden Centre and discover all about the country’s natural history! When you travel to the northern region, you will encounter Costa Rica’s most well-known conical beauty, the Arenal volcano. Towering over the town of La Fortuna, Arenal hosts a large variety of activities from hikes to canopy and horseback riding tours, or you can just relax in the hot springs. A visit to La Fortuna Waterfall is must and the town of La Fortuna itself caters to travelers of every budget, from a cheap hostel to 5-star hotel! Enjoy all the natural wonders Costa Rica is known for and enjoy the vacation of a lifetime! Let us connect you to the most beautiful regions in the country, with the most experienced tour operator, the best nature guides and the most fun packed itinerary!